This is looking REALLY cool! I'm digging the underground drop. Now, point on this doll where the truth touched you. ^Well it's not really by choice that they do it. They have a very strict height limitation policy so having anything with a decent vertical dimension requires these holes. It makes for some awesome looking rides. 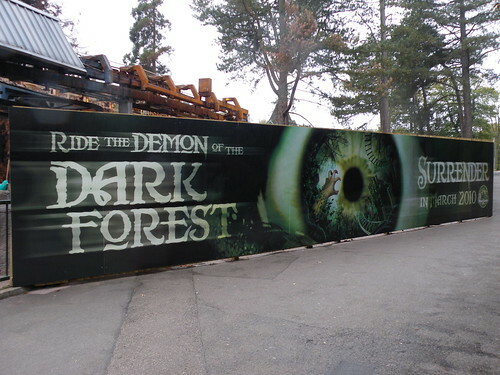 Nemesis looks amazing and I hope I can get to Alton Towers at some point in my life. ^I know about the restrictions, but rides like Rita dont go underground. I personally think AT is brilliant with the types of rides they've been able to install with their restrictions. Is this the world's first coaster to utilize TWO tire-driven lift hills? My money is on a horizontal track drop using that huge hole. The track in and out of the building before the hole are flat/straight, ruling out anyform of tilt IMO. Lol, they would have to be *really* desperate to go for that one. Just got home from an action packed day at AT! I was really excited to see the construction site for SW6 however I was left dissapointed! From seeing the site up close and personal, it's pretty easy to accustom yourself with the "front" part of the ride. The station building is getting quite tall now however the only track pieces installed in the building are the station, the second tyre lift hill which reaches the crest and bends to the right (the track stops here as it leads into the "worlds first" part of the ride which I assume will not be completed until the outer facia has been completed, or the park closes for good resulting in nobody getting a glimpse before the official launch!). Whilst riding Rita, you can see that directly underneath the upper station entry track you can see the feisty backwards drop going into a ravine which then leads into a large right banked bend also built into a ravine. This ravine will eventually return to a switch track then into the station. Upon speaking with a member of staff on Air he stated that all the staff do NOT know what the ride will be. All they know is that it's Intamin and it's height restriction is going to be 1.2. In his words "I don't think it's gonna be a big one coz the big ones are all 1.4". He also stated that rumour between staff was that it was to have 4 seat spinner cars like spinball. I can only assume that it's a glorified version of Tornado! I am aware that this is totally 100% speculation and hearsay proves nothing. After visiting the site I am a million percent sure it's a worlds first coaster (possibly spinner) with a backwards vertical switchtrack section (I don't mean this is a vertical drop I mean it as apposed to a horizontal switch. I'm thinking that once the train re-enters the station building, it will hit blocks, from here, the rear end of the track will pivot to 45% angle and connect with a segment of track directly underneath. The blocks will then be released and train will travel backwards backwards down the slope and then down the twisty backward drop. Jeez, I hope this makes sense, it's hard to describe what I've seen today! What's your thoughts on the Intamin Spinner trains? I personally hope they are, that or mega lite trains! Oh, and keep your eyes posted for my Photo TR, I'm too tired to do it tonight and am off to bed!